Okay this is not a description of my planned trilogy (at least I hope not). “Hush” Excuse me. Sorry for the interruption. Willow (see Meet Willow) was beating on my back and yelling in my ear. “Now my dear, why don’t you have a seat and wait your turn.” I was really getting frustrated with her, but I tried to keep my inner voice calm and rationale. Oh sorry, let me explain. I finished Lesson Three and just now starting Lesson Four. Evidently Willow thought this course was going to be all about her and she just found out that it was IE’s turn in Lesson Four. She is not happy and is throwing a bit of a fit. “Just shut up and sit DOWN”. So much for calm and rationale. Oh, oh. She is sitting in the corner and sulking. That can’t be good. Oh well, there’s nothing that can be done about it. At least she is quite. Hmmm, when I just said IE would review the story lines and determine the quality, Willow just smirked and gave a little grunt. I really don’t understand women at all. I know that is a cliche, but I am pretty sure cliche or not I am going to pay for this some how in the future. Regardless, I have just started Lesson Four and can’t wait to see how one determines if a story will be good or not. I hope the first thing Holly does, in this lesson, is explain what “good” looks like. So look for my next Post to see if any of the story lines Willow and I created in Lesson Three are Good, Bad, or Ugly. If you don’t want to guess when the next Post will come out, go ahead and submit your e-mail address in the field in the right hand column and you will get a notification when I put up the next Post. You won’t receive any other e-mails from me and I don’t know anyone important enough to sell your e-mail address to (bummer), so you don’t need to worry about that either. Exciting, engaging, full of twists and turns! 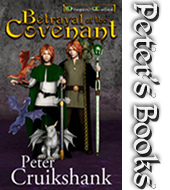 Peter’s words paint a picture of a magical world of action, intrigue and even humor. 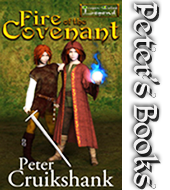 Those who love Medieval Fantasy will truly enjoy this book. 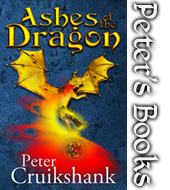 A very well written, engaging, traditional fantasy novel.